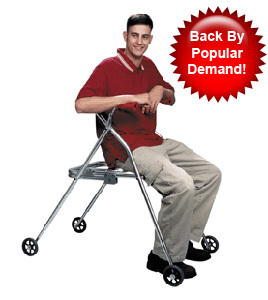 These walkers include seats that fold up or down, for walking or sitting. Designed as temporary seats for users who may lack the stamina to stand or walk for long periods. Seats should only be used when the walker is stationary. These should not be used as a replacement for wheelchairs, strollers, or similar devices. For specifics on sizes, prices, and model numbers, measure the distance from the floor to the middle of the user’s buttocks, and then consult our sizing chart. Available in 6 sizes, fitting toddlers through adults who are over 6 feet tall. All walker models fold, for easier storage and transportation. Kaye Walker Model W2HR with optional rotational handgrips.